This is in Las Vegas. I’ve walked past him every day this week on the way into work and said hi to him and he says he has hardly put it down. I’ve never seen someone so happy to receive something and it brings me so much joy to see him every day reading from it. I will be bringing him a charger so that he can charge it [and] I gave it to him as a gift. I did it because I make a very good living but have also been nearly where this man is. An hour or two of my salary to make someone’s life infinitely more bearable is the least I can do. I make really good money and I have been at the bottom. I try to help out the homeless whenever I can with non-monetary means. When I was talking to him and found out that he really liked to read but was stuck with the same few books, I couldn’t just go on having it in my pack knowing someone could get so much enjoyment out of something that, to me, costs so little. Also I really wanted an excuse to get the new Kindle Voyage anyway. I will be bringing him a charger tomorrow. There are more than enough books on there to keep him busy for a while. Especially some of the more difficult reads like Faulkner and Joyce. I’m going to give him my address so he can ship it back to me (I’ll pay upon receipt) and I can add more books whenever he runs out. He’s reading the Game of Thrones series right now. [I gave him] LOTS of American classics (Faulkner, Hemingway, etc. – everything by a lot of authors), everything by Cormac McCarthy (my favorite author), the Game of Thrones series, some more fantasy and sci-fi stuff – a ton really, there were a couple hundred books on there I think. Update – People following the source thread on Reddit are now contributing to a fund which will allow Paul to use any available WiFi and thus buy himself his choice of new books when he wants to. You can share encouraging example of #kindness using the buttons below. Thank you. What a meaningful thing to do. I am glad you were able to see beyond the “homeless person” to the “person” Many cannot. This is wonderful! Such a great gift! Books can really bring you into another world, full of possibilities and hope! I’m glad for this man! Great gift for a great man! The Kindle Voyage was a good excuse. 🙂 Your gift will come back to you in other ways. I have a friend who once lost everything once because her husband became hooked on drugs. She had to move her children into a shelter and the stress was unimaginable. I packed up my Gameboy with charger and several games and sent then to her. That was the year the Gameboy came out with the brighter screen and like you, all I needed was an excuse. Great story, very sweet of you. Every time I drop in around here, you restore my faith in humanity. Thank you! That’s good to hear. Thank you, Sir. I am so happy that I followed you and was able to read this story!! Amazing! Inspiration! Moving!! I am speechless !! Wow, that’s such a thoughtful idea! I am very impressed. Way to toot your own horn! Kindness and generosity are voided when u brag/post them. 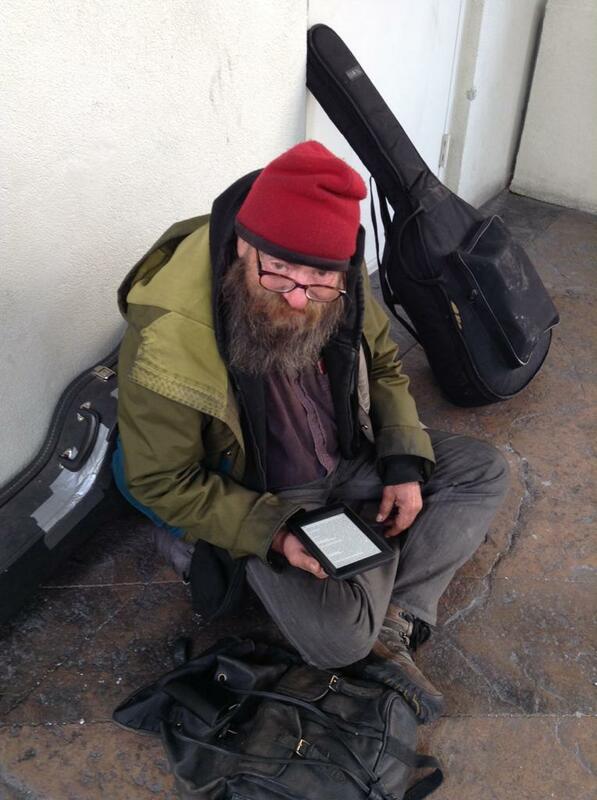 I gave a homeless man a laptop I didn’t tell anyone till now. Get a life. But surely the recipient of kindness can benefit even if ego is involved? A very kingly gift! books being the property of only nobility, not that awfully long ago! Wow, that must have changed his life! Oh that’s so PAWSOME!! Wonderful story! Thanks fur sharing human! I love to read too and can only imagine how that gift brings joy to this man. How awesome!! You are an inspiration to many of us!